Platte County graduate NaRon Rollins will represent Pittsburg State at the upcoming NCAA Division II Indoor Track and Field Championships, slated for March 9-10 at the Robert W. Plaster Center in Pittsburg, Kan.
Rollins transferred to the MIAA school after spending the previous two years at Butler (Kan.) Community College. He will enter ranked No. 3 in the 200-meter (21.14) and No. 5 in the 60-meter dashes (6.74). Pittsburg State junior NaRon Rollins has qualified to Division II Indoor Track & Field Championships this weekend in Pittsburg, Kan. The former Platte County High School standout is ranked in the top 5 in both the 60- and 200-meter dashes. He is one of 19 Gorillas to qualify for the event at their home stadium. 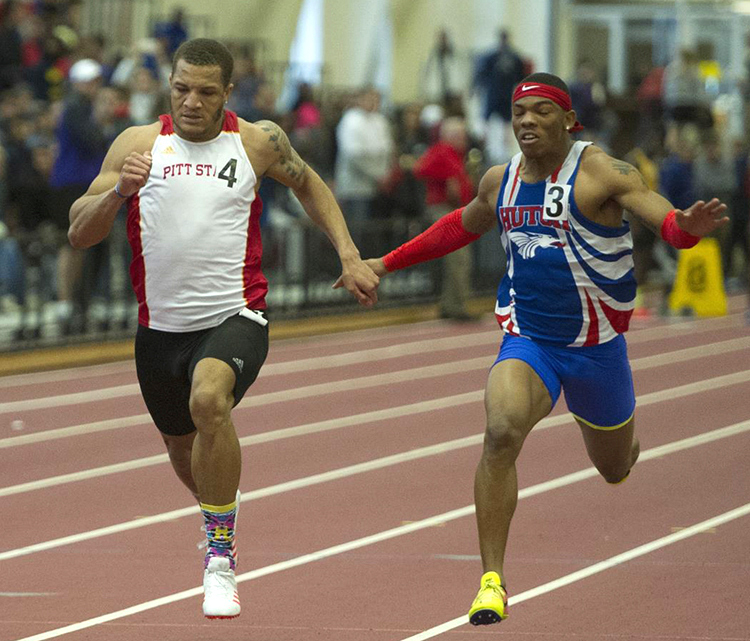 Rollins helped lead Pitt State to the MIAA Indoor Track & Field title on Sunday, Feb. 25. The Gorillas won for the second year in a row — fourth in five years — scoring 141 points and claiming the title by 48 points. Rollins won the Men’s High Point Scorer Award with 21 ½ points. He took first in the 60- and 200-meter dashes and was part of the 4x400-meter relay team that placed third. South Dakota sophomore Chris Nilsen enters as one of the favorites to win the men’s pole vault during the NCAA Indoor Track and Field Championships slated for March 9-10 in College Station, Texas. Nilsen, a Park Hill graduate, won the title last year and enters with the top-ranked height at 19 feet, ¼ inch, set at the Nebraska Tune-Up. Nilsen will represent the Coyotes — the only Summit League program with athletes to qualify for the championships — which begins at 5:30 p.m. on Friday, March 9. Nilsen is almost one of the 10 men’s competitors on the Bowerman Pre-NCAA Indoor Championship watch list, released on Thursday, March 1 by the U.S. Track & Field and Cross Country Coaches Association (USTFCCA). The award is presented to the most outstanding male and female athlete in the nation, essentially the Heisman of track & field. Nilsen is one of five athletes that were on the preseason watch list and remain in the group to be considered for the award, which was first presented in 2009. Other finalists include athletes from Auburn, Texas Tech (two nominees), Florida, New Mexico, Syracuse, Texas A&M, Southern California and UTEP. Nilsen is the only pole vaulter in the group of 10. On Monday, March 5, Nilsen was named the USTFCCA Midwest Field Athlete of the Year. Nilsen won the same honor in the outdoor season last June. Nilsen won the championship at five meets this year, including the Nebraska Tune-Up, Minnesota’s Jack Johnson Classic and Iowa’s Hawkeye Invitational. Platte County graduate Matthew Schmitt was one of three West Virginia wrestlers named to the 2018 Academic All-Big 12 wrestling team. Schmitt, a redshirt freshman who is a business major, garnered second-team accolades. To qualify for academic honors, a wrestler made have a grade point average between 3.00 to 3.19, having maintained at least a 3.0 the previous two semesters. Park Hill standout Landry Shamet earned another first-team all-conference honors. The 6-foot-4 redshirt sophomore at Wichita State was named to the American Athletic Conference first-team on Monday, March 5, on a team voted by the league’s coaches. Shamet helped the Shockers to a runner-up finish in their first year in the AAC, going 24-6 — 14-4 in league games. He is the team’s leading scorer at 14.6 points per game and led the AAC in assists with 5.2 per game. He was a first-team All-Missouri Valley Conference selection and freshman of the year last season.